In agriculture, a terrace is a piece of sloped plane that has been cut into a series of successively receding flat surfaces or platforms, which resemble steps, for the purposes of more effective farming . This type of landscaping, therefore, is called terracing. Graduated terrace steps are commonly used to farm on hilly or mountainous terrain. Terraced fields decrease both erosion and surface runoff, and may be used to support growing crops that require irrigation, such as rice. 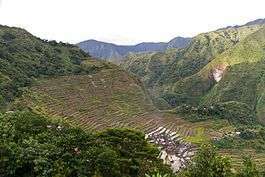 The Rice Terraces of the Philippine Cordilleras have been designated as a UNESCO World Heritage Site because of the significance of this technique. 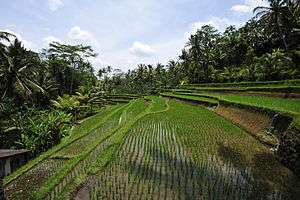 Terraced paddy fields are used widely in rice, wheat and barley farming in east, south, and southeast Asia, as well as other places. Drier-climate terrace farming is common throughout the Mediterranean Basin, e.g., in Cadaqués, Catalonia, where they were used for vineyards, olive trees, cork oak, etc., on Mallorca, and in Cinque Terre, Italy. In the South American Andes, farmers have used terraces, known as andenes, for over a thousand years to farm potatoes, maize, and other native crops. Terraced farming was developed by the Wari' and other peoples of the south-central Andes before 1000 AD, centuries before they were used by the Inca, who adopted them. The terraces were built to make the most efficient use of shallow soil and to enable irrigation of crops. ↑ "Farming Like the Incas". Smithsonian Magazine. Retrieved 2015-09-20.